Well, I love the ocean. It is vast and dangerous and calming and tumultuous—it is both familiar yet mysterious. Since the book itself is a retelling of my own experiences as a sexual assault survivor, of someone who had an abortion (as a result of the assault), I used the ocean as a metaphorical, and sometimes, physical landscape to the book. Besides that, I used the characters and tropes of Mother Mary and Mary Magdalene as a way to tell the story—to morph those two women together as one complex, nuanced character dealing with womanhood, loss, pregnancy and pregnancy loss, assault, sexuality, and gender. For me, what perfect way than narrating through two women who have stood for our ideas of what womanhood—and sexuality—are? So, the Marys are on a journey out to sea, through the harsh and harrowing waves—and we see if they come out on the other side—and what has happened to them. Also, it’s fun to note that Tori Amos has a song called “Marys of the Sea,” which was also on my mind. It’s a lovely song. 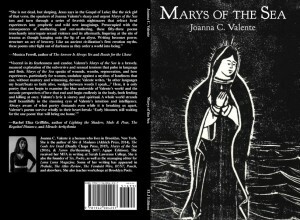 You don’t consider yourself a Christian, so why use the Marys as tropes/metaphors? I don’t think you have to be, or consider, yourself Christian to appreciate this sense of duality—and to want to do justice to the way women are portrayed even now—as if purity and innocence and sexuality and motherhood are somehow separate. That being said, I did suffer through 13 years of Catholic school, which is ironic, as I’m not Catholic. I even taught at one for a little while, if you can imagine that. It was actually pretty fun, but that’s an entirely different story. When you get discouraged, what helps you rally through? Chai lattes, grapes, long walks while listening to Yann Tiersen, talking to other writer friends who talk me off the proverbial literary ledge. It’s hard tirelessly working, getting rejected, or dealing with a lot of difficult writers if you’re an editor, so it’s impossible to say you aren’t going to feel discouraged. I just remind myself that I have a life outside of the writing community. I’m lucky to live in NYC, though, where I can let my mind go anywhere while I walk. It’s one of the few ways I can meditate. What do you love about the lit community? How supportive the community can be in times of trauma and pain. I’ve found so many beautiful friends and supporters of not just my work, but as a friend. This means everything. How do you want to change the lit community? What’s your least favorite part of it? I want it to become a more inclusive place for all people—a place where we can not only talk about progressive change, but actually do something about it and inspire others—creating and strengthening a sense of community. In general, I’ve been trying to do this with Yes Poetry, CCM, and Luna Luna Magazine with various projects (ie: the “A Shadow Map” anthology, an issue focusing on special needs/chronic illnesses, and disabilities for Luna Luna, and a #NotTrump series at YP). This type of work is never finished, of course. This goes into my least favorite part community—in that I do think a lot of institutions, organizations, and individuals go with the status quo in fear of offending people—or worse, just out of laziness. For me, being a writer is standing up for what you believe, for being outspoken even when it’s not the popular opinion, in order to create positive change. When did anything ever come easy? This means publishing more people of color, people with special needs and disabilities, people who identify as LGBTQ—and just generally owning what you do—not just saying the popular thing. On a beach in Cape Cod—or any beach really, but especially a spooky one—with hot tea, dark chocolate, and lots of pillows. Favorite item(s) of clothing you own. These shoes and socks. 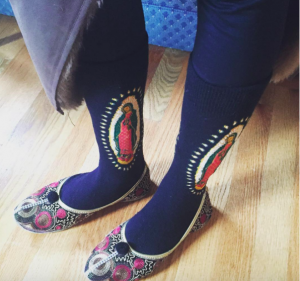 The socks, of course, are Lady Guadalupe, and match my book. Who doesn’t want socks that match their book? Billie Holiday, Rachmaninoff, Sun Ra, Beverly Kenney, Tim Hecker, Arvo Part, John Coltrane, Electric Wizard, Bobby Hutcherson. What are three books that you’ve always loved? Mrs. Dalloway by Virginia Woolf, Nadja by Andre Breton, and Beloved by Toni Morrison. My fantasy it that unicorns will come and shoot glittery laser beams out of their eyes, and we all live in some beautiful garden on the ocean after. In actuality, I think the end of the world is going to happen over a long period of time—so long and murky that we won’t even realize as it’s happening. I hope I’m happy enough when I do pass on, however—and that I was able to find closure with those I love, and myself—because in the end, what else actually matters? Just a gothier Cleocatra version of my real self. I’m a lot more cheerful in person than my persona lets on—and a lot more awkward and self-deprecating in person than online. I feel like my online persona is the “cooler” version of me. Tarot cards. Never know when you need them. 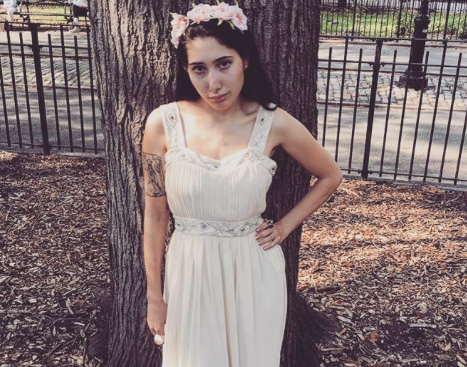 JOANNA C. VALENTE is a human who lives in Brooklyn, New York. They are the author of Sirs & Madams< (Aldrich Press, 2014), The Gods Are Dead (Deadly Chaps Press, 2015), Marys of the Sea (2016, ELJ Publications) & Xenos (2016, Agape Editions). They received their MFA in writing at Sarah Lawrence College. Joanna is also the founder of Yes, Poetry, as well as the managing editor for Civil Coping Mechanisms and Luna Luna Magazine. Some of their writing has appeared in Prelude, BUST, The Atlas Review, The Feminist Wire, The Huffington Post, Columbia Journal, and elsewhere. Joanna also leads workshops at Brooklyn Poets.